$50 million makeover: Reimagining LaSalle Park. WKBW's Nikki DeMentri has more. 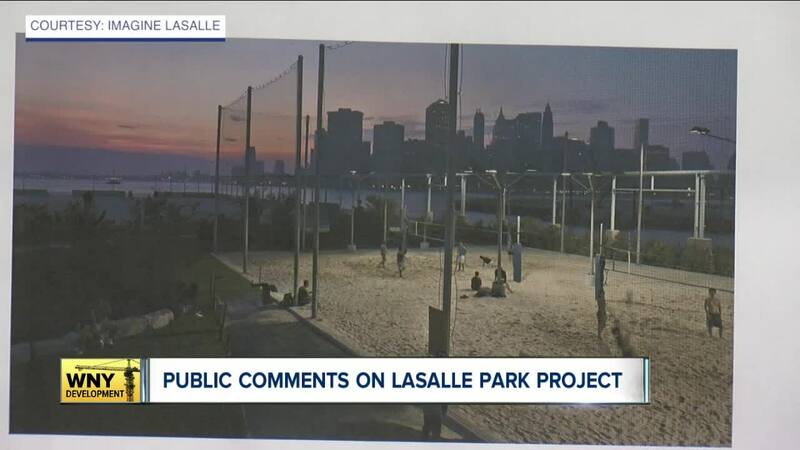 BUFFALO, N.Y. (WKBW) — LaSalle Park on Buffalo's West Side is one step closer to transforming into Ralph C. Wilson, Jr. Centennial Park after Monday evenings public workshop on the park's redesign. Dozens came out to hear from Brooklyn-based architect Michael Van Valkenburgh and share their input for the $50 million project. Van Valkenburgh's firm is spearheading the ' Imagine LaSalle' Project . His vision for the 77-acre space includes everything from new topography to adding new winter sports and waterfront activities. These designs based on suggestions from last month's public meeting. Some brought concerns about athletics and others discussed safety and public transportation concerns as they put Post-it Note after Post-it Note on several boards talking about what they want to see happen. It was back in October that the Ralph C. Wilson, Jr. Foundation donated the $50 million for the redesign. From that money, $40 million is going into the construction, while $10 million is reserved for upkeep. Van Valkenburgh stressed the importance of giving the park it's own identity. Van Valkenburgh believes the preliminary study model is expected by the end of spring, while the entire project should be roughly finished in four years.